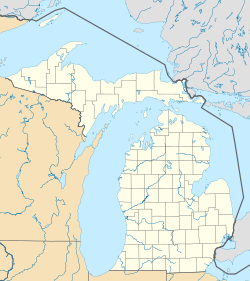 Redford, officially the Charter Township of Redford, is a charter township in Wayne County in the U.S. state of Michigan and a suburb of Detroit. The population was 48,362 at the 2010 census. Springwells Township and Bucklin Township were formally organized and laid out by gubernatorial act on April 12, 1827. Due to postal regulations prohibiting two post offices having the same name, when a township was subdivided unique names had to be found. The Bucklin name was extinguished when it was split on October 29, 1829, along what is today Inkster Road into Nankin Township (west half) and Pekin Township (east half), named as a result of a wave of interest in China. In March 1833 Pekin was renamed Redford and the southern half became Dearborn Township on April 1. The name Redford was chosen because Indians and pioneers forded the River Rouge where the river runs through Redford. "Rouge" is French for "red." The township used to go all the way to Greenfield Road, but in the 1920s the eastern portions of the township were annexed by Detroit. This annexation ceased in 1926 when the township was given "charter" status by the Michigan legislature. In 1918 there was a post office named "Five Points" operating between 6 Mile Road and 7 Mile Road along the road of that name. Redford is the site of Hosanna-Tabor Evangelical Lutheran Church and School, whose hiring practices spurred the 2012 Supreme Court Case Hosanna-Tabor Evangelical Lutheran Church and School v. Equal Employment Opportunity Commission. Redford is also the site of the first Fretter's electronics store. Redford Township is a western suburb of Detroit. According to the United States Census Bureau, the township has a total area of 11.2 square miles (29 km2), all land. The middle branch of the River Rouge flows through the Lola Valley Park in the township. Ashcroft creek, another branch of the Rouge River flows for about a half mile in the southeastern corner of the township before entering Detroit's Rouge Park and then into the main branch of the Rouge. Tarabusi Creek of the Bell Branch, another branch of the Rouge River, flows through Western Golf Club and Bell Creek Park. In 2010 Redford Township had a population of 48,362. The ethnic and racial makeup of the population was 64.7% white, 28.7% African-American, 0.8% Asian, 2.3% reporting more than one race, 0.6% reporting other races (apparently including those who reported being Native American and being Pacific Islander as well as those who just marked the other box) and 2.9% Hispanic or Latino of any race. The African-American population increased by about 200% between 2000 and 2010, while the overall population of the township declined by 6%. The U.S. Census Bureau also defined Redford Township as a census-designated place (CDP) in the 2000 Census so that the community would appear on the list of places (like cities and villages) as well on the list of county subdivisions (like other townships). The final statistics for the township and the CDP were identical. As of the census of 2000, there were 51,622 people, 20,182 households, and 13,582 families residing in the township. The population density was 4,597.4 per square mile (1,774.8/km²). There were 20,605 housing units at an average density of 1,835.1 per square mile (708.4/km²). The racial makeup of the township was 87.98% White, 8.54% African American, 0.43% Native American, 0.76% Asian, 0.02% Pacific Islander, 0.57% from other races, and 1.70% from two or more races. Hispanic or Latino of any race were 2.02% of the population. There were 20,182 households out of which 31.8% had children under the age of 18 living with them, 50.4% were married couples living together, 12.1% had a female householder with no husband present, and 32.7% were non-families. 27.3% of all households were made up of individuals and 11.6% had someone living alone who was 65 years of age or older. The average household size was 2.54 and the average family size was 3.12. In the township the population was spread out with 25.3% under the age of 18, 7.0% from 18 to 24, 34.0% from 25 to 44, 18.7% from 45 to 64, and 14.9% who were 65 years of age or older. The median age was 36 years. For every 100 females, there were 96.1 males. For every 100 females age 18 and over, there were 92.9 males. The median income for a household in the township was $49,522, and the median income for a family was $56,461. Males had a median income of $41,923 versus $29,987 for females. The per capita income for the township was $22,263. About 3.2% of families and 5.1% of the population were below the poverty line, including 6.0% of those under age 18 and 5.2% of those age 65 or over. As of the census of 2010, there were 48,362 people, 19,148 households, and 12,387 families residing in the township. The population density was 4,597.4 per square mile (1,774.8/km²). There were 20,739 housing units at an average density of 1,835.1 per square mile (708.4/km²). The racial makeup of the township was 66.4% White, 28.9% African American, 0.5% Native American, 0.8% Asian, 0.02% Pacific Islander, 0.8% from other races, and 2.5% from two or more races. Hispanic or Latino of any race were 2.9% of the population. The public schools are operated by the Redford Union School District, South Redford School District and Clarenceville School District. The Roman Catholic Archdiocese of Detroit used to operate Bishop Borgess High School and Academy (closed in 2005) and Detroit Catholic Central High School (relocated to Novi, Michigan in 2005) in Redford Township. Redford Township Library is located on West Six Mile Road. The library service began in the 1920s, with the bookmobile providing service to the citizens of Redford Township. The old Redford Township District Library operated from 1962 until August 23, 2004 when the library moved to a new building. In a $4.5 million project, the old library building was turned into an open-air market, amphitheater (the Redford Marquee) and public green space. The Redford Marquee opened in July 2008. The library was facilitated by a $8.5 million community bond. The 58,600-square-foot (5,440 m2) facility is based on a 2.6 acres (11,000 m2) site that is being leased for $1 for 99 years. The library's collection consists of 100,000 books and periodicals, 2,500 CDs, records, cassettes and other audio materials, in addition to 2,500 video items. Redford is the birthplace of musician Ted Nugent (December 13, 1948), arena football player Stephen Wasil (April 14, 1984), and NFL player Eric Wilson (September 26, 1994). Folk musician and songwriter Sufjan Stevens' song "Redford (For Yia-Yia & Pappou)," which appeared on his 2003 album Michigan, mutely chronicles Stevens' childhood experiences in Redford Township, where his grandparents lived. ^ a b "Race, Hispanic or Latino, Age, and Housing Occupancy: 2010 Census Redistricting Data (Public Law 94-171) Summary File (QT-PL), Redford charter township, Wayne County, Michigan". U.S. Census Bureau, American FactFinder 2. Retrieved September 8, 2011. ^ Romig 1986, p. 199. ^ "Redford charter township, Wayne County, Michigan". Retrieved October 25, 2016. ^ "404 Error Page". semcog.org. ^ "Library Information" Archived 2010-05-06 at the Wayback Machine, Redford Township District Library, accessed September 21, 2009. ^ "Marquee market, amphitheater opens in downtown Redford", Jon Zemke, MetroMode, July 31, 2008. ^ "Redford Township will build bigger library", The Detroit News, November 19, 2002. ^ "Redford Township District Library", Online Highways Travel Guide, accessed September 21, 2009. ^ Schruers, Fred (March 8, 1979). "Ted Nugent: The Ted Offensive". Rolling Stone. Retrieved May 11, 2015. ^ "Redford Township - Sister Cities Commission: Sister Cities International!". redfordtwp.com. Archived from the original on 2016-03-07. Romig, Walter (October 1, 1986) . Michigan Place Names: The History of the Founding and the Naming of More Than Five Thousand Past and Present Michigan Communities. Great Lakes Books Series (Paperback). Detroit, Michigan: Wayne State University Press. ISBN 978-0-8143-1838-6.